I got approached to do Soul Sessions quite awhile ago by Mitchell Bitanga aka Remitch. Soulsessions is one of the still Existing DOPE parties in LA, ailment in the same vein as the historic rootdown and Do Over, where good music and good vibes is the top priority. I hit them with a modified “Originals set” – being on a west coast “TOUR” – made me doing an “ALL VINYL SET difficult, and when I do a real Originals set, best believe its all vinyl. This time around I had to use some mp3’s so I wouldn’t get hit with the extra luggage / hurt my back syndrome. It’s Been QUITE Some time since I’ve released a New Podcast, being on the road makes it very difficult to record. LIVE FROM THE SOULSESSIONS – a little over an hour of my rocking for LA. You will here some familiar stuff of course – A lot of these people want me to do stuff I do on my MIXTAPES, so there are some signature songs and transitions I drop. Anyway, I hope y’all enjoy it as much as the crowd in LA did . Peace to The Soul Sessions crew – Mitch, Jay villinueva, Bernie, DJ Plann B, Inka one for rockin wit me – ANYONE ELSE I MISSED! I signed some cds for this special collabo, met up with the folk Jay Huggins from 5 and a Dime and Bert Custodio who put together the dope artwork for the project, and of course was there to celebrate the event and Rock the Party for RHYTHM & RECREATION at Thin/Onyx. The whole event was captured by the fine folk at MAHFIA.com. 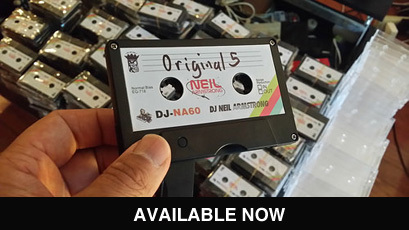 Peep the Video for more background on the collaboration, and make <a href=”http://www.5andadime.com/shop_list.php?Brand_ID=neilarmstrong&Gender=All&Type=All&Status=All”sure to get yours BEFORE THEY ARE GONE!! DJ NEIL ARMSTRONG x 5&A DIME COLLAB TEASER from MAHFIA.COM on Vimeo. That’s him and myself in the pic above.Does the name ring a bell for you?? Well if you are a fan of my mixtapes it should. I got a lot of my blending style from listening to Mixtapes that were ON ACTUAL CASSETTES – Ones in particular made by the Duo of G-Bo the Pro and Rei Double R.
i was influenced SO much by them , I actually gave them a shoutout on one of my earliest Mixtapes – Sweeet . About two years ago now, I got the opportunity to Befriend my never before met mentor and his Mixtape partner in crime Rei Double R.
Around that same time, he started a party called < a> , held at < a> . on May 5th, NYC, ya’ll will get a chance to witness the very first time – I’m going to be DJing with G-Bo the Pro, ALONGSIDE Fellow Super DJ’s TONY TOUCH, REI DOUBLE R, Victor Vargas, and DJ Dres, to Celebrate Properly, 2 YEARS of partying it up uptown style! For those that don’t know, this one is a big Deal, and this one is ON CINCO DE MAYO. Peep the DJ List. I am THROWING DOWN WITH SOME KINGS. Hit me @ [email protected] SUBJECT : CAMARADAS for guestlist BEFORE 11 pm! Please come and join us as we celebrate the 2 year anniversary of WayBack Wednesdays, Cinco De Mayo, and the 1st OFFICIAL THrowdown of DJ Neil Armstrong & G-BO THE PRO. This year I’ve moved on from the 3 stripes of the Blueprint to the 3 stripes of Adidas, sovaldi but there are still remnants of my days wearing all black everything surfacing in the public consciousness on the daily. NEW YORK (March 22, 2010) – Today, as part of an ongoing creative collaboration with JAY-Z and Madison Square Garden (MSG), ABSOLUT® VODKA introduces “NY-Z” – a 14-minute short film featuring JAY-Z and directed by popular music and culture photographer Danny Clinch. Featuring exclusive footage of JAY-Z and John Mayer as they prepare for the September 11 benefit concert at MSG, NY-Z offers a rare glimpse into the life of native New Yorker Shawn “JAY-Z” Carter as he discusses his hometown and what it means for an artist to “arrive” with a performance at the world’s most famous arena. The short film is available for viewing at facebook.com/ABSOLUT. At that time I was still running around the world on the 1’s and 2’s for jay, so yours truly has appearances peppered throughout the documentary. From Flushing to Madison Square ;) Roc Boys 4Ever….